There are many views as to the way in which the public perceives the impact of biotechnology on their lives. There does not appear to be a consensus as to the acceptability of the use of this technology in any aspect of its use. This session will largely be used to discuss the issues, and why there are so many differences around the world. The discussion will attempt to identify ways in which the public may be made more aware of the issues which are important in our perception of this new technology. There are very few generalisations that may be made. It is usually claimed that medical applications of biotechnology are more acceptable in general than those in agriculture, industry or food. Terminally ill patients and their immediate families, keen to allow experimentation that would prolong their lives or alleviate the symptoms of their disease, are thougre thought to willing to allow experimentation involving 'modern' biotechnology. the production of drugs and therapies in industrial settings which do not involve the 'release' of the modified organism, but only of the product seem to result in little concern or condemnation. The concerns (where they exist) relate to the purity of the drug, or its side effects rather than the manner in which it is produced. Food additives produced using 'modern' biotechnology which do not involve the inclusion of the viable living modified organism are thought to be more acceptable in most societies than those products which contain the living organism. An astonishing 61% of New Jersey residents approve of using genetic engineering to produce new plants with just less than one third, 28%, approving the use of the technology on animals. The two most useful (and least dangerous) applications are thought to be pharmaceutical production and genetic tests for detection of illness. The two least useful are the use of the technology in food and the introduction of human genes into animals for xenotransplantation. 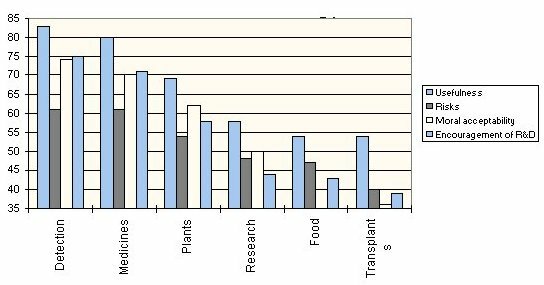 Very few were happy with the production of 'humanised' organs for xenotransplantation or the development of modified animals for health related research. These were not thought morally acceptable. Fewer than 25% of Europeans believe that current regulations are sufficient to protect people fre from the risks associated with modern biotechnology. The graph below is taken from the website referred to in footnote 2. The questions related to benefit to Society (usefulness), risks, moral acceptability and whether or not research and development should be encouraged. Transplants: Introducing human genes into animals to produce organs for human transplants, e.g. into pigs for human heart transplants. Will genetically modified animals present any health hazards to people? Is it ethically acceptable to create genetically engineered animals? Are genetically engineered foods safe to eat? Will engineered foods be less expensive and/or more nutritious? Will decisions about the use of Biotechnology products include input from all those who will be most directly affected? What is the ethical and moral framework for creating all types of engineered organisms? How adequate are current regulations for assuring public safety? How can the public have a direct voice in the risk assessment process? Will increased knowledge about biotechnology be sufficient to alleviate concerns? Do television and the press accurately depict biotechnology issues? 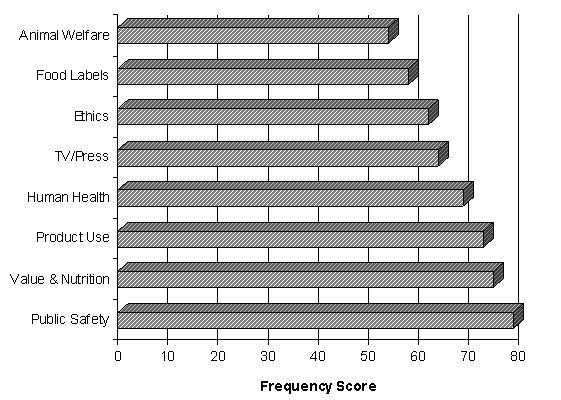 A graph taken from the same source indicates the issues which appear most frequently in the United States press when discussing the impact of biotechnology. Perceptions of risk are very complex. Risk associated with the food produced using biotechnology may be very small, but is perceived as much greater. An understanding of the perception of risk is needed. Many argue that the risk assessment should include the public reaction to the risk. 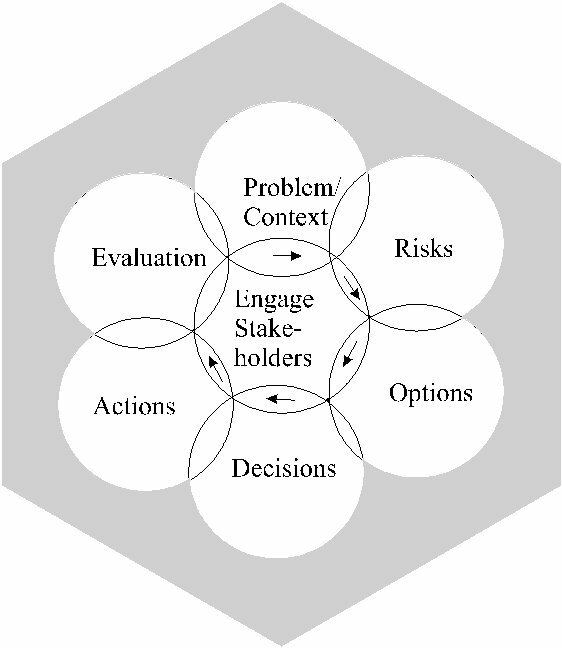 A diagram that may be useful for this discussion has been produced in "Framework for Environmental Health Risk Management" produced in the US in 1997. Using Iterations if new information is developed that changes the need for or nature of risk management.